The Cornerstone Biblical Commentary series provides students, pastors, and laypeople with up-to-date, accessible evangelical scholarship on the Old and New Testaments. Presenting the message for each passage, as well as an overview of other issues relevant to the text, each volume equips pastors and Christian leaders with exegetical and theological knowledge so they can better understand and apply God's Word. 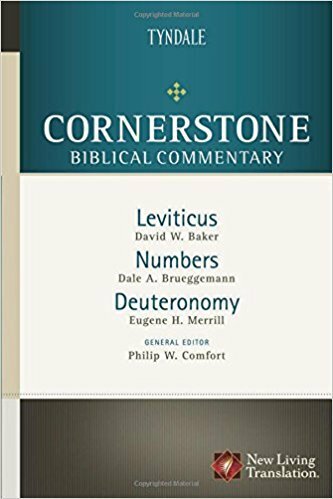 This volume includes the entire NLT text of Leviticus, Numbers, and Deuteronomy. David Baker, Ph.D., University of London, is professor of Old Testament and Semitic languages at Ashland Theological Seminary in Ohio. He serves as editor for the Evangelical Theological Society's Dissertation series and Studies series. He has authored several articles/books, including the NIV Application Commentary on Joel, Obadiah, and Malachi and The Face of Old Testament Studies: A Survey of Contemporary Approaches. Dr. Baker served as a Leviticus reviewer for the New Living Translation. Dale Brueggemann, Ph.D., Westminster Theological Seminary, pastored in Idaho throughout the 1970s. He has taught at Valley Forge Christian College in Philadelphia, and at Central Bible College in Missouri. Eugene H. Merrill, Ph.D., Columbia University, is Distinguished Professor of Old Testament Studies at Dallas Theological Seminary in Texas and Distinguished Professor of Old Testament Interpretation at The Southern Baptist Theological Seminary in Kentucky. He is currently director of Eurasia education services for Assemblies of God World Missions, and he has been heavily involved in ministry in Europe, Asia, and the Middle East. He is the author of several articles/books, including a commentary on Deuteronomy in the New American Commentary series and the Deuteronomy study notes for the NLT Study Bible. He also served as a Deuteronomy reviewer for the New Living Translation.